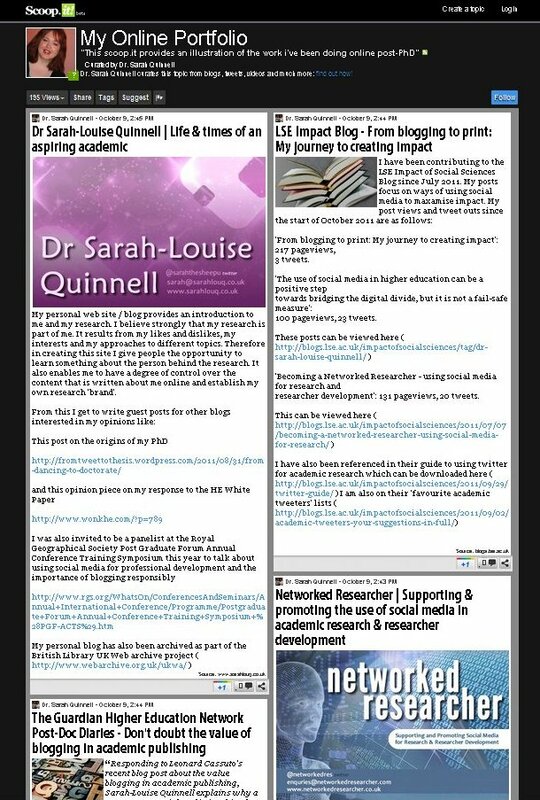 Early career researchers should look carefully at the benefits of incorporating social media into their academic work, writes Sarah-Louise Quinnell, whose use of blogging and social media tools in her PhD has led her to find her first academic post. In my previous posts here, and on Networked Researcher, I have taken time to emphasise how social media can be used for professional development purposes. The goal for many early-career researchers, especially those who have recently completed their PhDs, is to gain the first academic position. I have always said that I believe a well developed online identity will assist in promoting your work, and you as a researcher, and I can now say that I have gone from academic blog to academic job: I will soon start my new role as E-learning Development Advisor within the Graduate School Researcher Development Unit at King’s College London. When I initally completed my PhD I was somewhat concerned that I was becoming better known for my work with and in social media than I was for the conceptual topic of my PhD i.e. the role of capacity-development in the implementation of multi-lateral environmental agreements. However, to complete this research I had used a number of social media tools and applications and was aware of how important they were and what they could offer to academic research. It seemed then, that I brought something different to the table in that I came to discuss social media and its use in academic research from personal experience of using it to collect and present my own PhD data. To be able to advise people on how to use social media as a research and professional development platform it is necessary to be able to illustrate to prospective students and staff what can be done with this new technology and how it can be integrated into the research process rather than another add-on. I spent a long time thinking how to illustrate my ability to do the above prior to my job interview by presenting my online profile in a way that showed varying types and levels of impact and engagement without giving the interview panel a long list of links. I tried different types of web portfolio software and had varying degrees of luck, however none of them illustrated the material in the way I wanted. Twitter followers recommended I create a Scoop.it, which works as an online scrap book where I could literally scoop examples of my work online and put them together as a collection or portfolio. Using a Scoop.it I could add notes about what I had done and why as well as links to other articles etc. My Scoop.it portfolio is also completely interactive, allowing readers to follow links, rate, ‘like’, rank my page, and leave comments. Five years ago, when I started developing a website to conduct my PhD research I was viewed as being slightly mad and the work was not seen to hold any value. In some areas it was thought unlikely that these methods would deliver a quality PhD. Now, it is becoming obvious that more universities are recognising that digital communication skills are increasingly important across the board, particularly when it comes to research, research communication and institutional marketing. Talking about the application of social media in research and researcher development is not talking about the future of research, it is talking about research now.